For any woodworker, whether at home or out on site, having a suitable method in place to support your lumber is crucial. Are you tired of a rickety pair of mocked-up sawhorses and a makeshift tabletop bench? Very sturdy well made table. I needed two but for some unknown reason Amazon limited me to buying one, had to buy the second locally at a higher price. While BLACK+DECKER and Rockwell might dominate the workbench space, there’s no harm in a little competition. Rather than going for the standard Workmate review today, we’ll give you the lowdown on the WORX Pegasus, a budget-friendly alternative that won’t stiff you in terms of quality. Most woodworkers need a straight, flat surface for support and a pair of sawhorses to complete the set-up. What we would note front and center is that if you want the Pegasus to function as a sawhorse, you will need to consider buying 2 of them so factor this into your budgeting. That said, standing at 32 inches, you will easily be able to use the WORX in tandem with an existing sawhorse of the same height so don’t get hung up on this or consider it a deal-breaker. The sawhorse will comfortably bear loads of up to 1000 pounds. All you need to do is snap out the wings and you’ll get a table surface ideal for power tools or lumber and supporting a generous 300 pounds. This might not be enough for really rigorous commercial use but it’s more than fit for purpose for any home woodworkers and DIY enthusiasts. Durability and build quality is rather impressive, particularly for a more affordable bench. The ABS plastic is surprisingly rugged while the stand is strengthened with aluminum. Despite this, the Pegasus weighs in at just 28 pounds so it’s light enough to carry around without straining yourself if the need arises. This is further eased thanks to the neat foldable design. The Pegasus is a breeze to stash in limited spaces when not in use. There are a couple of quick clamps and 4 clamp dogs chucked in so you can get going straight out the box. You might struggle with third party clamps and fitments so be prepared to stick with WORX accessories. The clamps can also slot into the aluminum tracks serving up another dimension and turning your work table into a vise. You can slot the clamp dogs into 8 varied positions. For best results, you’ll need to use these pegs in tandem with the clamps rather than as a replacement. The pegs are designed to hold regular ¾-inch plywood making it perfect for sanding flush to the edge. The quick release clamps can be used independently and they are highly customizable. Pressing these into action is a superb way to hold your material in place when you’re using your circular saw. You’ll be able to fix some power strips to the underside of the Pegasus so you can support any corded power tools you might have. The Pegasus is designed in such a way that, if you undertake more substantial projects on a regular basis, you’ll be able to latch several work tables together. 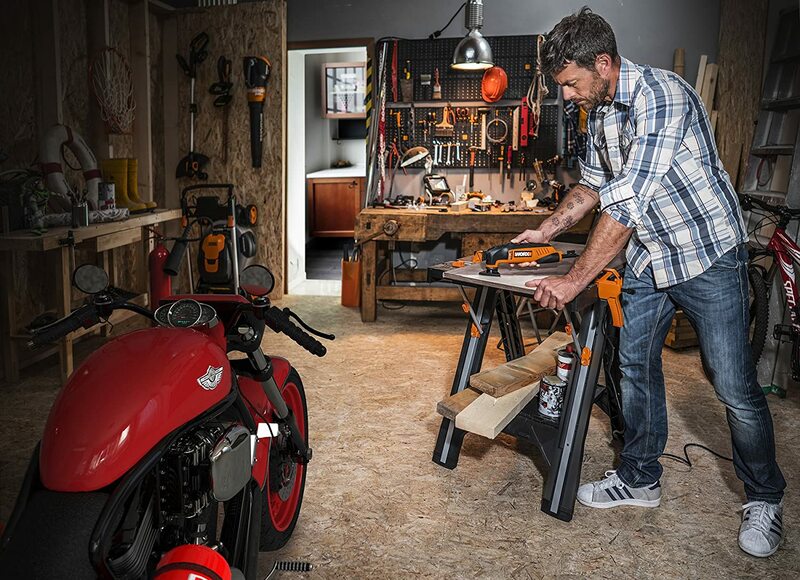 This gives you a fantastically large and adaptable working space if you have a bigger workshop to accommodate such an indulgence. If you’re prone to misplacing your fixings and accessories, you can keep them in the nifty table cavities so everything you need is close to hand. 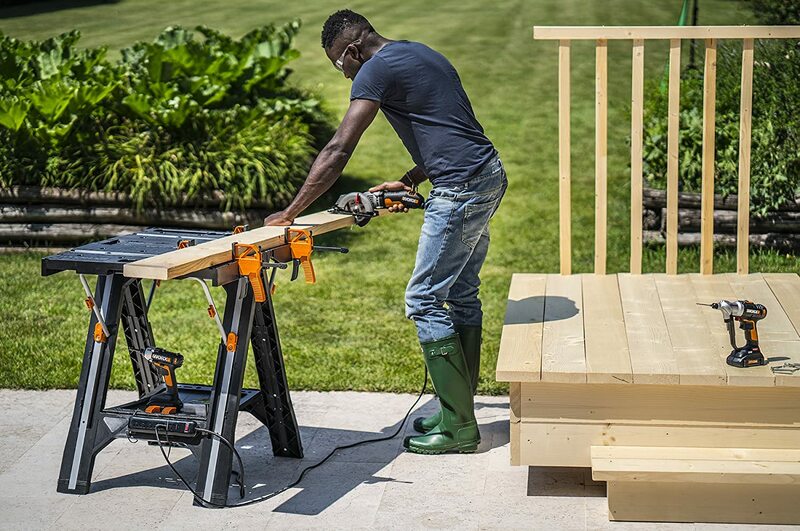 There’s simply no one-size-fits-all solution when it comes to getting the best work table or sawhorse but one of the key selling points of the WORX Pegasus is the way it combines both these workshop weapons into one handy unit. Whether you’re a home hobbyist looking for a solid and durable surface for your table saw or a contractor looking to support various bulky workpieces out on site, the Pegasus flies to the rescue. Backed with a class-leading 3-year warranty, what have you got to lose? 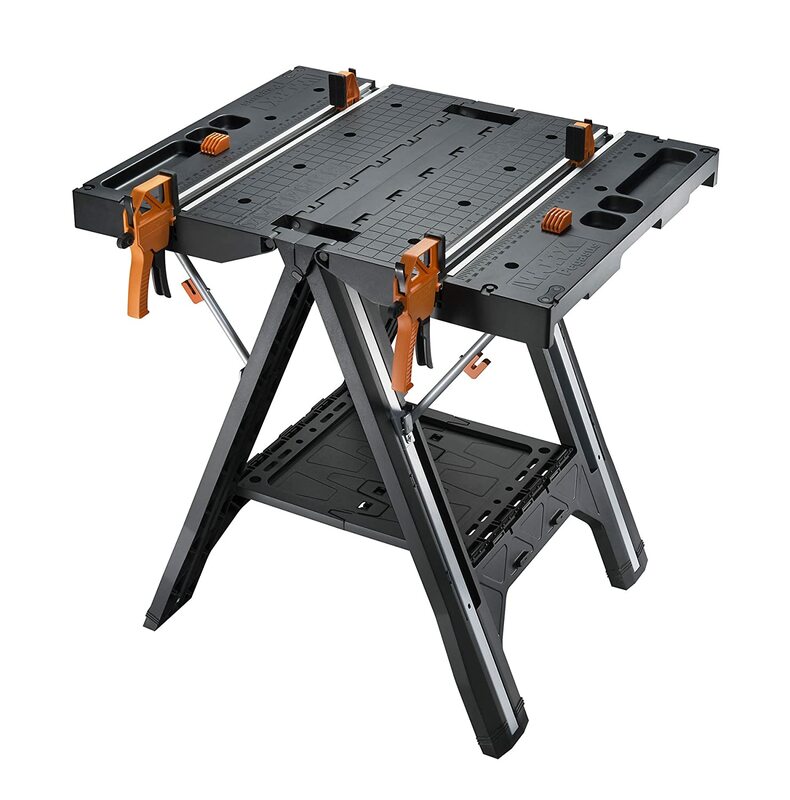 Check out the WORX Pegasus work table and sawhorse today while it’s still being offered at a steep discount! Share this guide - and help somebody today!